The antique Caucasian rugs get their name from the area in which they were made – the Caucasus. The Caucasus is a region that produces distinctive rugs since the end of the 18th century and the antique Caucasian rugs are primarily produced as village pieces rather than the fine and intricate city productions. Caucasian rugs are best known for featuring bold geometric and tribal designs in primary colors. The antique rugs from the Caucasus are primarily made of materials that are (or were) particular to their tribal provinces and some of the styles that are “typical” or better known to the Caucasus region are Shirvan, Dagestan, Kuba, Kazak, Karachopf rugs. Caucasian Rugs are probably the most widely collected type of antique rugs. The strongest market for Caucasian rugs has to be Italy who appreciates these rugs for their tribal and primitive designs. Another reason why the Italian market is so strong is the fact that most of the rooms as considerably smaller than those in the USA – since the Caucasian rugs are smaller in size (rarely bigger than 5 x 8 ) they are the perfect size for their rooms. Chief countries of origin were Kuba, Dagestan, Shirvan, Talish and Baku in the East, and Ganjeh, Kazak, and Karabagh in the southwest Caucasus. While Caucasian carpets tend to feature floral designs, their style or rendering is usually highly abstract or geometric, with considerable emphasis on rich and varied color. 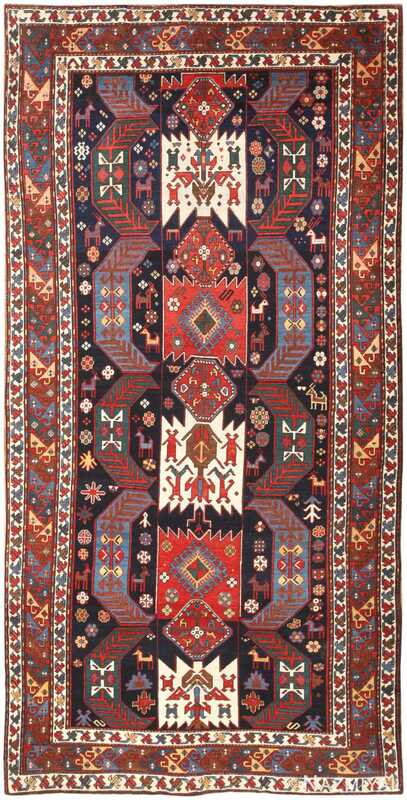 The mountainous region of the Caucasus has been an attested center of rug production since at least the seventeenth and eighteenth centuries. 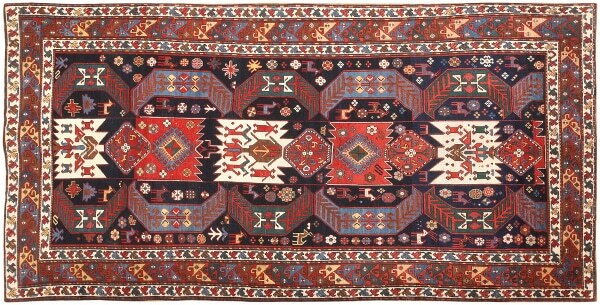 In the nineteenth century the Caucasus became a major area of village rug production for export under official Russian control. 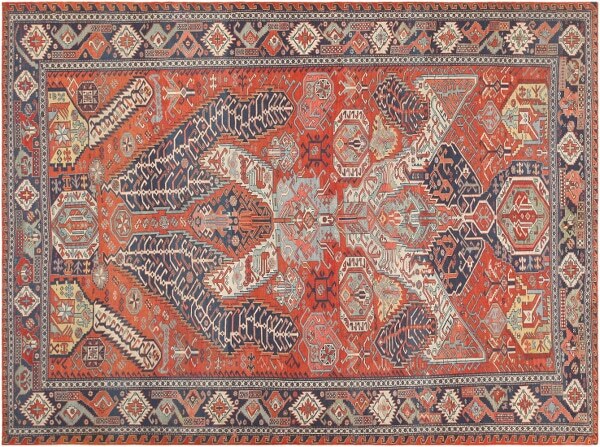 The rugs that were produced in the Caucasus during the great expansion of village weaving promoted by the Russian authorities in the second half of the nineteenth century have, until recently, become one of the most desirable genres for rug collecting. Indeed various types of Kazak rugs, Karabagh, Shirvan, and Kuba rugs still occupy a place of importance in the rug-collecting world, but their attractiveness has fallen off to some degree in the last decade. This is not due to changes in taste, availability, or other types of marketplace trend. There is surely no shortage of such rugs in the galleries of dealers or auction houses. And that is in fact a key to the problem. It is possible to encounter wonderful examples of Sevan or Karachop Kazak, Chelaberd Karabaghs (the so-called Eagle or Sunburst Kazaks, Konakgend Kubas, and the like in superior condition if one is willing to pay the hefty price that such rugs have come to command in fine condition. But such condition itself has now become a cause for serious concern or suspicion. The reason for this has to do with reprehensible practices that have been reported across the rug producing regions of the Middle East over the last decade or so. Antique rugs in fine condition are rarely pristine. However well they have been cared for, there is bound to be some sort of damage from moths, burns, or irremovable stains, all of which require areas of the pile to be re-woven. That has always been and remains acceptable to collectors. Such repairs can be done to a very high standard, especially by weavers in the Middle Eastern areas where the rugs were originally produced. Sometimes this is done using wool from the fragmentary remains of Kilims or tapestries which can be unraveled to yield great lengths of antique yarn with the spin and color of the same quality and texture as the wool in antique rugs that are in need of repairs. All this is well and good, but it has within it the potential for abuse. Some types of antique rug have for one reason or another become more desirable than others. It is easy to come across worn antique Caucasian rugs of various types that are simply not worth repairing. But it is worthwhile to save their foundations, to pull the remaining knots out of them and repair any holes or slits. For it is then possible to take antique yarn, unraveled from damaged or fragmentary Kilims that no longer have much market value, and to re-knot or reweave it into antique foundations to produce designs of the most desirable and valuable type. The resultant rugs are made entirely from antique materials. They have the wool quality and color of antiques, the texture or feel of antiques, and, if the weaver is skilled, the drawing or design quality of antiques, that will fool even expert dealers and collectors. They will even pass the test of scientific analysis like carbon-14 dating, since the wool is entirely antique. Such analysis will only disclose fraud if the Kilim yarns are appreciably older than the foundation or vice versa, and if multiple portions of the rug are tested. The rug would then appear to have different ages in different areas, which would indicate that something were amiss. But such rugs are not antique. Their manufacture is modern, and they are, therefore, worth far less than genuine pieces made long ago. The representation of such rugs as antiques is fraudulent, unless the dealer or seller is unaware that the rug is a modern pastiche of old materials, and, unfortunately this does happen. This is the risk that collectors and dealers alike are now up against, and it has had a chilling effect. One must really think twice before buying an antique rug that belongs to an established, sought-after type. If it looks to good to be true, perhaps it is, perhaps it is not a genuine antique, but a magic carpet. When I now see a Sevan or Karachopf Kazak with voluptuous, long, shaggy pile for sale, I am immediately suspicious, and my suspicion does not abate until I see documented evidence of the rug’s existence going back at least twenty years. And such documentation is often not available. There is no doubt that genuine antique pieces may get passed over as a result of this climate of informed caution or suspicion. But at today’s prices, who wants to take a magic carpet ride? 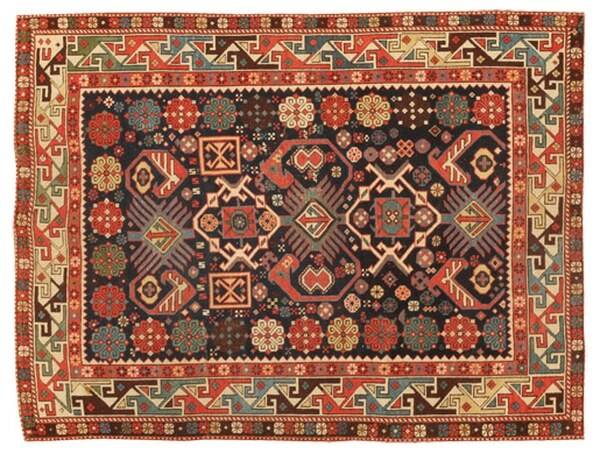 The mountainous region of the Caucasus has been an attested center of rug production since at least the seventeenth and eighteenth centuries. Caucasian rugs of this period are among the great masterpieces of classical or early rug production. 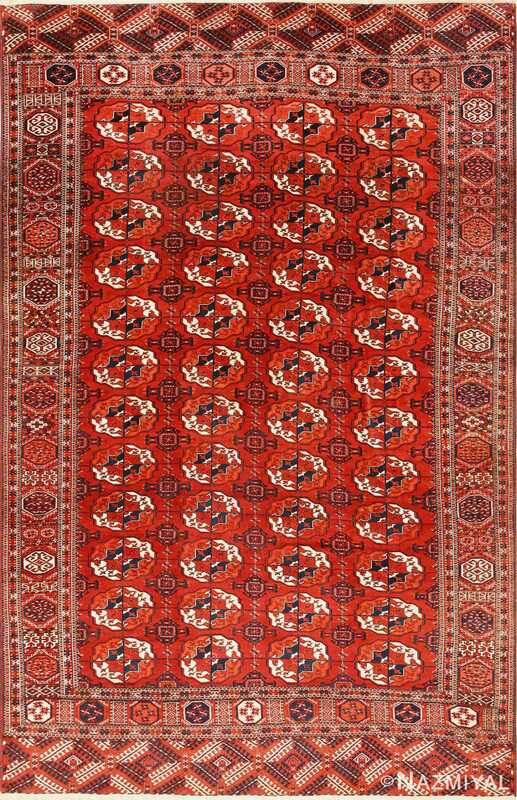 In the nineteenth century the Caucasus became a major area of village carpet production for export under official Russian control. Chief centers of production were Kuba, Dagestan, Shirvan, Talish and Baku in the East, and Gendje, Kazak, and Karabagh in the southwest Caucasus. While Caucasian rugs tend to feature floral designes, their style or rendering is usually highly abstract or geometric, with considerable emphasis on rich and varied color. 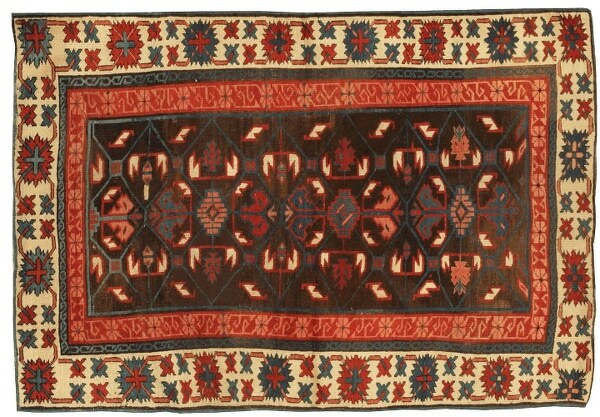 The rugs that were produced in the Caucasus during the great expansion of village weaving promoted by the Russian authorities in the second half of the nineteenth century have, until recently, become one of the most desirable genres for rug collecting. Indeed various types of antique Caucasian rugs such as: Kazak rugs, Karabagh, Shirvan, and Kuba rugs still occupy a place of importance in the rug-collecting world, but their attractiveness has fallen off to some degree in the last decade. This is not due to changes in taste, availability, or other types of marketplace trend. There is surely no shortage of such rugs in the galleries of dealers or auction houses. And that is in fact a key to the problem. It is possible to encounter wonderful examples of Sevan or Karchopf Kazaks, Chelaberd Karabaghs (the so-called Eagle or Sunburst Kazaks, Konakgend Kubas, and the like in superior condition if one is willing to pay the hefty price that such rugs have come to command in fine condition. But such condition itself has now become cause for serious concern or suspicion. The reason for this has to do with reprehensible practices that have been reported across the rug producing regions of the Middle East over the last decade or so. Antique Carpets in fine condition are rarely pristine. However well they have been cared for, there is bound to be some sort of damage from moths, burns, or irremovable stains, all of which require areas of the pile to be rewoven. That has always been and remains acceptable to collectors. Such repairs can been done to a very high standard, especially by weavers in the Middle Eastern areas where the rugs were originally produced. Sometimes this is done using wool from the fragmentary remains of kilims or tapestries which can be unraveled to yield great lengths of antique yarn with the spin and color of the same quality and texture as the wool in antique rugs that are in need of repairs. All this is well and good, but it has within it the potential for abuse. Some types of antique rugs have for one reason or another become more desirable than others. It is easy to come across worn antique Caucasian rugs of various types that are simply not worth repairing. But it is worthwhile to save their foundations, to pull the remaining knots out of them and repair any holes or slits. For it is then possible to take antique yarn, unraveled from damaged or fragmentary kilims that no longer have much market value, and to re-knot or reweave it into antique foundations to produce designs of the most desirable and valuable type. The resultant rugs are made entirely from antique materials. They have the wool quality and color of antiques, the texture or feel of antiques, and, if the weaver is skilled, the drawing or design quality of antiques, that will fool even expert dealers and collectors. They will even pass the test of scientific analysis like carbon-14 dating, since the wool is entirely antique. Such analysis will only disclose fraud if the kilim yarns are appreciably older than the foundation or vice-versa, and if multiple portions of the rug are tested. The rug would then appear to have different ages in different areas, which would indicate that something were amiss. But such rugs are not antique. Their manufacture is modern, and they are therefore worth far less than genuine pieces made long ago. The representation of such rugs as antiques is fraudulent, unless the dealer or seller is unaware that the rug is a modern pastiche of old materials, and,unfortunately this does happen. The writer was once admiring an antique Kazak hanging of the wall of a New York rug gallery. A Turkish dealer/rug restorer who was visiting the gallery approached me quietly and asked me to estimate the age of the piece. I ventured to place it sometime around 1880. When I pointed out that the brown pile was all corroded or at least lower than the rest of the pile, as it should be on an antique, he said, “we trimmed all the brown lower.” When I protested that the back of the rug was polished and smooth like an antique, he responded that they had burned off the fuzzy fibers of the back surface with a propane torch. And when I insisted that the wool and dyes were old, he conceded with a smirk that they were indeed, but that it made no difference. And he was right. It was still a new rug. Or for lack of a better term, it was a “magic carpet.” This is the risk that collectors and dealers alike are now up against, and it has had a chilling effect. One must really think twice before buying an antique rug that belongs to an established, sought-after type. If it looks to good to be true, perhaps it is, perhaps it is not a genuine antique, but a magic carpet. When I now see a Sevan or Karachopf Kazak with voluptuous,long, shaggy pile for sale, I am immediately suspicious, and my suspicion does not abate until I see documented evidence of the rug”s existence going back at least twenty years. And such documentation is often not available. There is no doubt that genuine antique pieces may get passed over as a result of this climate of informed caution or suspicion. But at today’s prices, who wants to take a magic carpet ride? Flower patterns do not play an essential role in Caucasian rugs. Usually the design patterns in Caucasians are geometric, often without symmetry. If flowers designs are present, they will generally found in the border, or used to complement a geometric pattern. They will not be a dominant factor as they are in many Persian, or Indian rugs. Caucasian rugs pre-1920 are rare but greatly desired because of their simplicity in design. This was before the area came under Russia, and its rug weaving craft was truer to its culture. Because these areas were influenced by nomadic tribes, it is harder to determine the exact origin by design. The structure and materials use are a more reliable tool in identification. Generally the warp and weft from natural wool, and a Turkish knot is used. Carpets using a thicker wool usually came from the more rural mountainous areal, while we can look toward Shirvan, or Kuba for a finer wool. In area populated by both Christians and Muslims, it is easy to distinguish the weaver by religion. Muslims, as it is forbidden by the Koran would have no animals depicted in their carpets; they leaned more toward producing prayer rugs. The Christian weaver did not have these restrictions. Generally Caucasian rugs are geometric in design. However the closer we move toward the Persian border, the more likely the shapes are to be rounded. Though many fine Caucasians have been produced after 1920, if you are really attracted to the Caucasian Antique rug, look for the earlier ones. 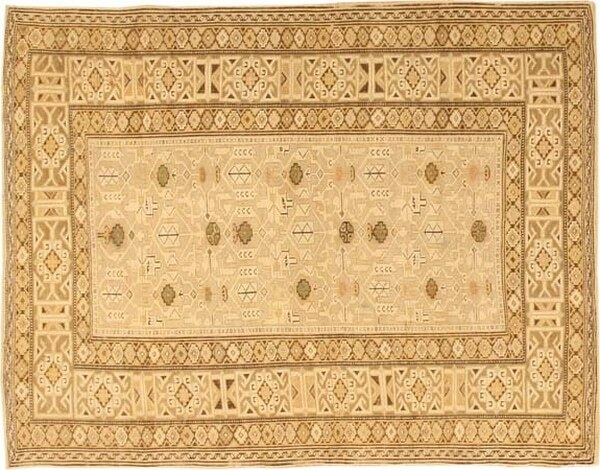 The antique Caucasian Konaghend carpets represent one of the more interesting and sophisticated types of carpets from the Caucasian village rug production of the nineteenth century. Always well woven in a tight technique with first rate drawings, antique tribal Caucasian Konaghends carpets tend to have “Kufic” borders and a field design of allover arabesque tendrils transformed into a highly geometric repeating network. The tendrils generally form or approximate small medallions that recur across the field in superimposed horizontal rows. No. 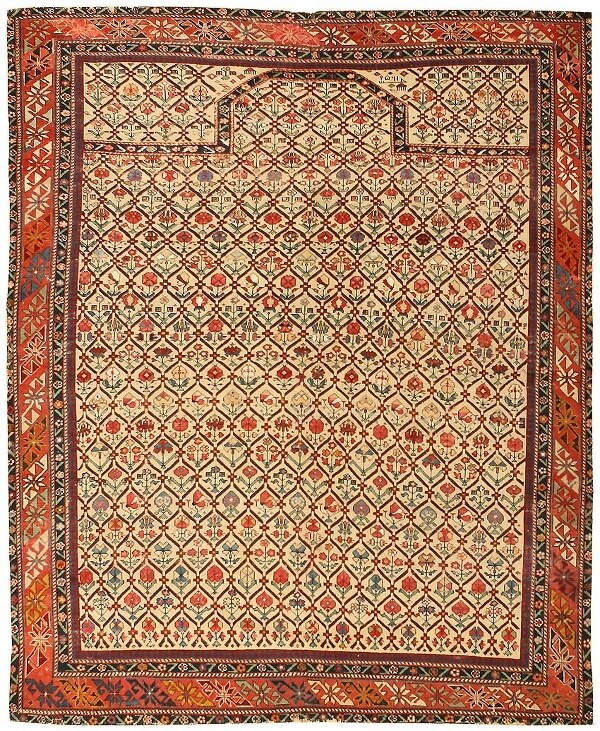 2738 from Nazmiyal, shows an excellent example of this type of antique Caucasian rug. The main border follows a long tradition that adapted the stylized geometric Kufic script of the early Islamic period to carpet designs. At first glance, another Konaghend from Nazmiyal, simply appears to be a more stylized or simplified version of the standard design of this type. Here the oblong shield-like medallions in the field seem to take precedence as an allover tessellated design, while the tendrils have been reduced to small curling bits in the intervening spaces. But a closer look at this antique rug reveals that this example reflects the impact of another design tradition. It goes back to the allover tessellated medallion designs of Timurid carpets from the fourteenth to fifteenth centuries, which have rarely been preserved, in the original; they are known mostly from representations in Islamic manuscript painting. 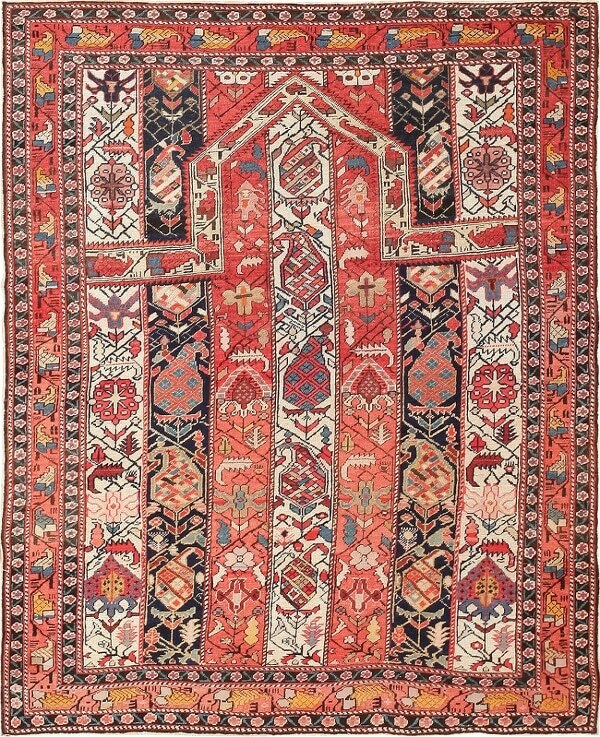 This unique and outstanding carpet clearly reflects such Timurid precedent, although it is unclear how and when such tradition reached the Caucasus. 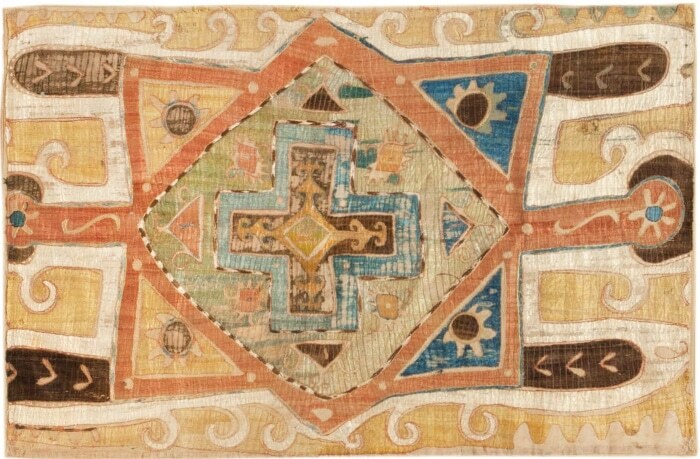 It provides a rare glimpse into the factors or influences behind Caucasian village rug design, whose history before the nineteenth century is very obscure. A long and narrow runner length carpet, this alluring Caucasian rug is a uniquely beautiful work, the detail in which reveals a carefully planned and executed design. This antique runner from Karabagh features an all-over pattern of elegant trailing foliage along with the classic Karabagh rose motifs. 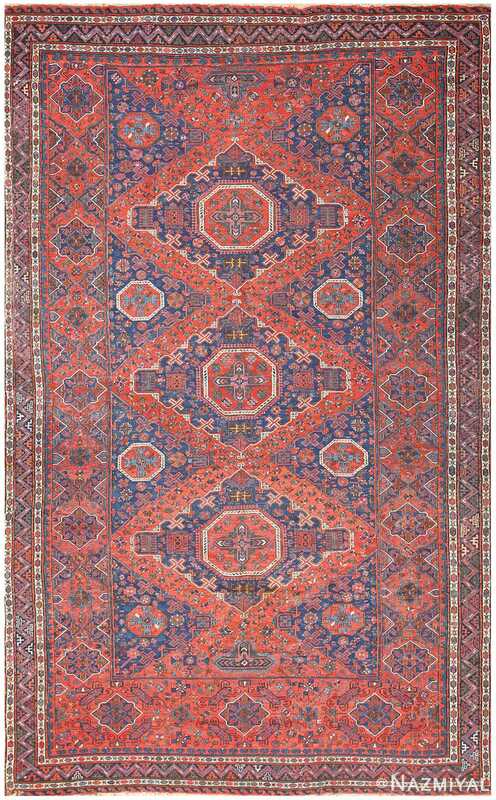 This antique Oriental Karabagh long rug from the Caucasus plays off European designs. 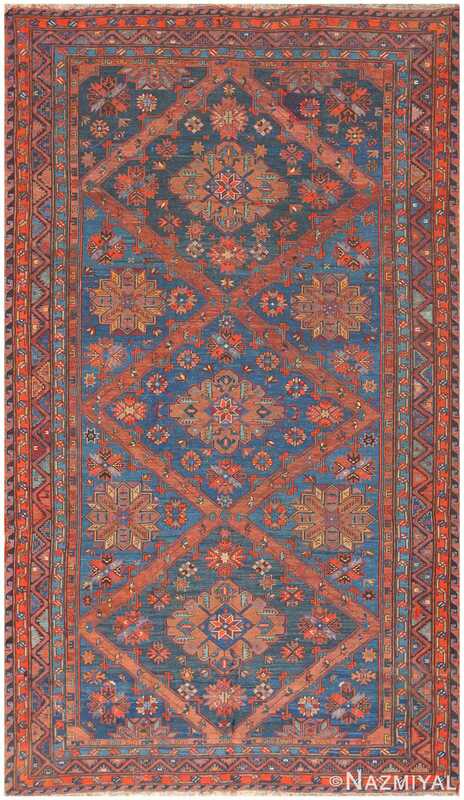 Though made in the Caucasus, this elegant antique Karabagh reflects the design of western European carpets. This delicately lush antique Karabagh has a design inspired by French Savonnerie and Aubusson carpets. 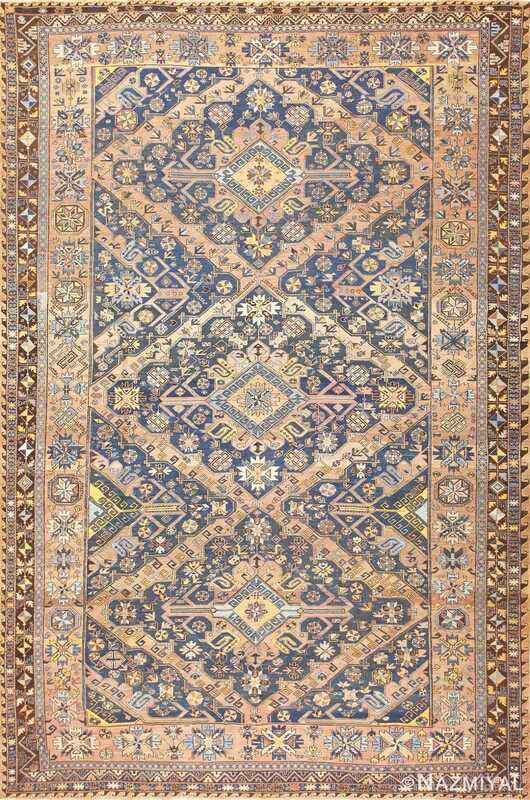 This dazzling Caucasian rug features a breath-taking arrangement of geometric floral details, arranged in captivating manner. Delightfully geometric, this Karabagh runner length rug is a notable example of the enduring aesthetic appeal of tribal design. Woven with auspicious tribal symbols and wide borders decorated with elegant floral patterns, this Talish carpet is an exceptional example of rare designs produced along the Caspian coast. Crafted in the hills of the Caucasus, this distinguished antique Kazak rug features a rare pillar of bracketed medallions adorned with angular animals and symbols.